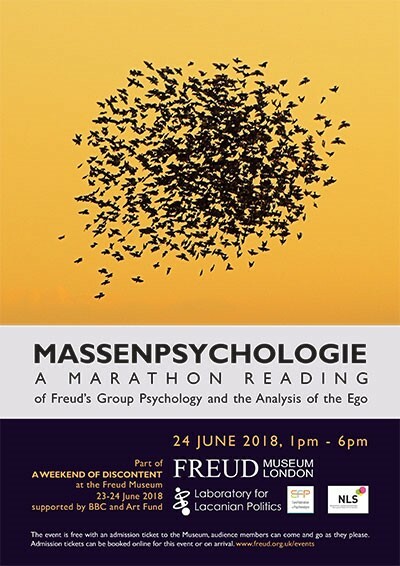 A special event at the Freud Museum taking place within the framework of Lacanian Action, supported by the BBC and Art Fund: A Reading of the entire text of Freud’s text Group Psychology and the Analysis of the Ego. This event is designed to coincide with the 80th anniversary of Freud’s arrival in London as an immigrant fleeing persecution from the Nazi’s. It involves members of the London Society, Marie-Hélène Brousse, Patricia Tassara and significant representatives from other orientations in London. For more information please follow this link to: The Freud Museum website.